Teaching your dog a chin-rest behavior is useful for training shy, overly excited, or reactive dogs. It is also helpful building cooperation during medical procedures (vaccinations, medication administration, and eye and ear care), and grooming. Are you looking for a fun training exercise this spring? Teaching your dog to go around an object, such as a cone, is a useful skill and the foundation for many dog sports. 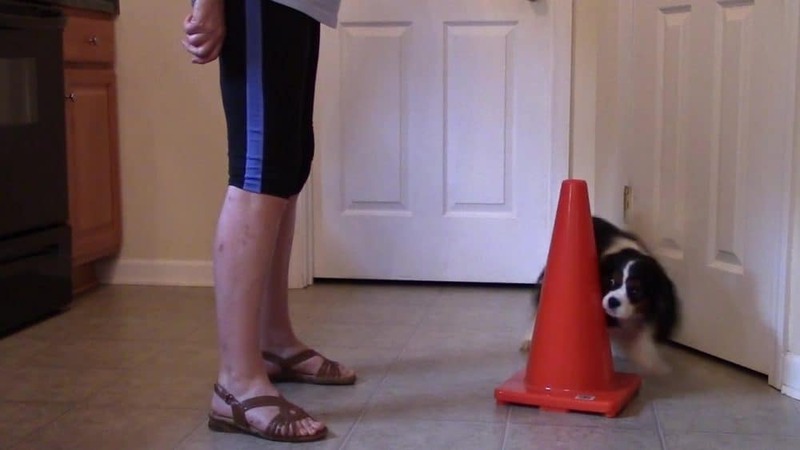 Learn how to teach your dog to go around an object in this video and give it a try! If you don’t have a cone, buckets, stools, or a waste basket make a great substitute! Targeting, where an animal touches an object with her nose or paw, is not just a useful behavior for dogs—it can be a very useful and fun behavior for cats, too! A target can be used to lead a cat to a particular spot (such as an exam table), can help shelter cats become more friendly and adoptable, and can serve as the foundation for many tricks—such as jumping through a hoop, spinning, or rolling over. Watch target training in action in this video, and learn more about cat training in Karen Pryor Academy’s Train Your Cat course! Strategic treat placement is a key part of dog training, yet it is often overlooked. The placement of reinforcement during and after a behavior can make a difference as to the dog’s understanding of the behavior you are trying to teach. Where do you want the dog to be positioned to set up for the next rep? 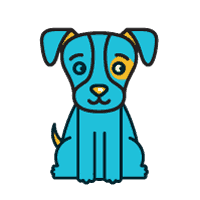 If you want to set the dog up to repeat an action, for example settle on a mat, toss the treat away from the mat after you click so that the dog moves off and has the opportunity to return to the mat. Watch in this video as KPA faculty member Laurie Luck uses strategic treat placement off the mat to reset the labrador puppy for the opportunity to repeat the behavior! Cues should always be clear and consistent. However, cues do allow for some flexibility and can be transferred. Are two cues too similar, so similar that your dog confuses them (for example, “stretch” and “fetch”)? Do you need to deliver a cue from a distance? Do you want the versatility that is possible when your dog knows a variety of cues? In all of these instances, knowing how to transfer a cue accurately is important. Watch as Karen Pryor Academy faculty member Laura Monaco Torelli demonstrates how to transfer a cue! Teaching your dog to settle on a mat is very useful—for both practical and safety reasons. Dogs need a safe place to settle down. When you teach your dog to settle on a portable mat, your dog has a safe place to settle anywhere! You can send your dog to his mat while you are cooking, eating dinner, or even while you are out on the town. Your dog always has a safe place to lie by your side. Teaching your dog a chin rest is useful for building cooperation during medical, such as vaccinations, administration of medications, and eye and ear care. Watch as Karen Pryor faculty member Laura Monaco Torelli uses a chin rest behavior for an ear exam! Constant barking is stressful for shelter dogs, staff, and visitors. A small shift in routine management can reduce the noise level to zero. Watch as Karen Pryor Academy faculty member Steve Benjamin makes this shelter a bark-free zone by clicking for quiet! Does your dog know how to pay attention to you? When your dog is focused on listening to you, training will be more successful! In this video, Karen Pryor Academy faculty member Debbie Martin shows you how to get your puppy’s attention by teaching him to look at you.